Danny Crates is one of the world’s most inspiring Paralympic athletes and motivational speakers. After losing his right arm in a horrific car accident at the age of 21, Danny Crates was determined to overcome this obstacle in his life, focus on the future, and regain his positive attitude. Undeterred and with utter determination, Danny found his way back to the rugby field within just six months of his accident – and shortly thereafter into the world of paralympic sport, where he quickly dominated the scene. Through his twelve-year career, he won every major title in the sport, including the World Championship, the European Championship, the Paralympic World Cup and, famously, the gold medal in the men’s 800 metres T46 final at the Athens 2004 Paralympic Games, the same year that also saw him set a new world record. Since he retired from international athletics, Danny has continued to build his reputation as one of the leading motivational speakers in the world of business and sports, delivering keynote presentations that leave his audience motivated and inspired to achieve their goals both personally and professionally. A master storyteller, Danny’s fifteen years of experience as a corporate speaker shines through. He is dynamic and his talks are full of warmth and humour, quickly captivating his audience. He builds his presentations around his ‘5 Key Elements to Success’ which resonates with every department within the business or team, and guarantees excellent returns for his clients way beyond presentation day. Danny tailors his presentations for his audience and transfers his Paralympic success into success for them, whether it be overcoming hurdles, change management, optimising personal performance and excellence, goal setting, teamwork or building exceptional results from failure. Alongside his speaking, Danny is also a published author of his motivational autobiography “Danny Boy,” a TV presenter and sports commentator, and he continues to develop his own business portfolio. 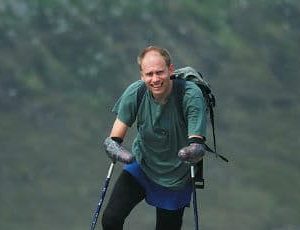 He is also patron of several charities and loves to challenge himself through sporting fundraising events, including Ride Across Britain, Wings for Life World Run, Ride London, the London Marathon, and many more.